The purpose of this protocol is to ensure that the soil water content is kept similar in all the plants being tested during the course of a water stress imposition, regardless of the size of the plant, allowing then to compare even maize to arabidopsis. The very purpose of it is to determine a soil moisture content where a number of physiological activities get affected. The physiological response of crops to soil drying in dry-down experiments is measured by a slow and controlled imposition of water stress in potted trials for approximately 2-3 weeks and by monitoring the daily transpiration by weighing pots. Dry-down can be conducted at vegetative and reproductive stages depending on the purpose of water stress study. Plants are usually grown in glasshouse/greenhouse in PVC pots, but it can also be done outdoors. The selection of pot size depends on the plants stage of screening and type of crops (Table 1). Dry-down in vegetative stage plants are usually grown in 8” pots (length=18.8cm, diameter=22.2cm) with soil holding capacity of 6 kg of sandy clay loam Alfisol filled at bulk density of approximately 1.35g cm-3, or Vertisol at bulk density of approximately 1.10g cm-3. Dry-down at late vegetative stage to pre-flowering stages are grown in 10” pots (length=22.5cm, diameter =27.2cm) with 10kg of sandy clay loam Alfisol, or 7-8kg Vertisol. Flowering and post-flowering stages or in case of hybrids like maize dry-down at late vegetative stage to flowering stages 12” pots are recommended with soil holding capacity of 14 kg of sandy clay loam Alfisol. Vertisol (Black soil) can also be used instead of Alfisol. Before filling the pots, the soil is sieved to particles size smaller than 1cm to ensure homogenous packing of the soil in pots. After filling of dry soil, each pot is weighed to ensure that equal amount of soil is filled in all the pots of the experiment (+/- 50-100g). Plants are grown in randomised design (RBD) with 10-12 replications (4-6 well-watered (ww): 6 water-stressed (ws)). Seeds are sown in 3-4 hills in each pot. Fertilizer (DAP) is applied at the rate of 0.3 g/kg of soil as basal dose. Final plant number in each pot depends on species and can be either 1 or 2. Final thinning is to be done at the latest by 12-14 days after sowing. All the plants (ww and ws) are fully irrigated before commencement of dry-down. Having an homogenous set of plants in each genotype is ideal. If plant growth is not uniform within a genotype, plants of highest, middle, and lowest growth rank need to be distributed equally across the WW and WS treatment, although this is a much less-preferred option. Dry-down assessments in cereal like pearl millet and sorghum usually start at about 20-30 DAS for early vegetative stage screening and 35-45 DAS for vegetative stage screening. Thermo-hygrograph sensors (Tinytag Ultra 2 TGU-4500 Gemini Datalogger Ltd, Chichester, UK or USB data loggers, Lascar Electronics) position within the glasshouse at canopy height, which record data on temperature (o C) and relative humidity (RH) % on an hour or two hour basis. The afternoon before the start of dry-down experiment all pots are over watered until they start dripping. Then pots are allowed to drain overnight. The following day early morning (0800-0900 h), soil surface of the pots are covered with plastic sheets, on top of which a uniform 2cm layer of plastic beads is applied, together to check soil evaporation. Pots are weighed after soil covering and this initial pot weight is considered as the field capacity pot weight. In some cases, an extra set of plants is harvested at the time the drydown starts and serves as an estimate of the initial biomass (pre-treatment harvest), which can be used to have an estimate of the transpiration efficiency (TE) during the drydown period. Pots are weighed every day at the same time of the day, usually in the morning, after which the calculation of water to be added is done. The well-watered plants of each genotype are maintained at about 80% field capacity, which is about 100g below the field capacity weight for 8” pots and up to 200g below the field capacity weight for larger pots. So, the amount of water to add to these pots are: Weight at FC – Weight Dayn – either 100 or 200. The water-stress plants are exposed to gradual water stress by allowing a maximum daily water loss of 70-150g (depending on pot size, larger loss for larger pots), regardless of plant size. In other words, a plant grown in a large pot, transpiring 200g/day would receive 50g water back. The amount of water loss can be modified according to objectives as previously described (Vadez and Sinclair, 2001; Kholoval et al., 2010; Choudhary et al., 2013). For instance, a faster stress imposition would be imposed by increasing the daily water loss. When transpiration of ws plants decrease below 10 % (0.1 NTR value; described below) of that in ww plants, all the plants are harvested and dried in oven for 48 hours at 60oC. The difference in re-watering related to pot size (based on vegetative and reproductive stage assessment) allow imposition of relatively similar kinetics of stress imposition in pots varying in size and therefore in water availability. The transpiration of all pots on each day is calculated as the difference in pot weight between successive days plus the water added to pot between two successive weighing. The transpiration values are normalised in two-step to facilitate comparison. First, the transpiration ratio (TR) is calculated by dividing the transpiration of each individual plant of a given genotype by the average ww transpiration of that genotype. In a second normalisation step, the TR is normalised by dividing each TR value over time by the average of the TR value for initial 3-5 days (when the drying pot were still in the well-watered stage). The second normalisation gives the normalised transpiration ratio (NTR), which account for plant-to-plant variation in transpiration within each genotype. When NTR of stressed plant fall below 0.1, stop the dry-down experiment. Genotypic variation can be observed in reaching 0.1 NTR in that case staggered harvesting can be done. remaining in the pot in every day of the drydown is back-calculated as the difference between daily weight and final weight, divided by the total transpirable water (initial pot weight-final pot weight). NTR is then no longer expressed as a function of calendar days but as a function of FTSW. Data are then analyzed by doing a two-segment linear regression of NTR vs. FTSW combined for all the data of a genotype. The regression analysis is conducted by using the nonlinear regression procedure (Ray and Sinclair 1997) in GraphPad Prism 5.0/6.0/6.2 (GraphPad Software Inc.). 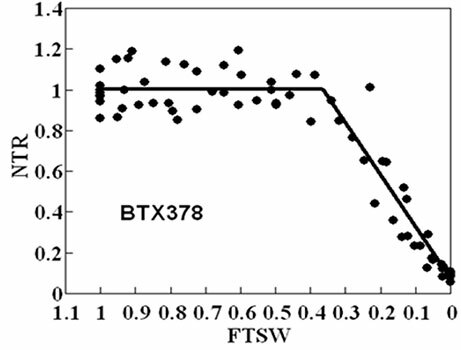 An output of the regression analysis is the FTSW threshold (X0) between the two linear segments representing the initiation of the decline in transpiration rates. 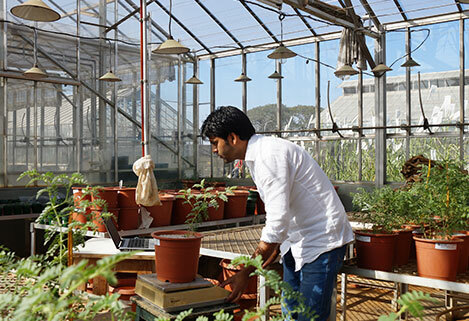 Transpiration efficiency (TE) can be calculated during the period of the drydown by dividing the increase in biomass during the dry-down experiment by the total water transpired during the same period of time. Plant biomass increase is obtained by subtracting the biomass of plants at the end of the dry-down experiment by pre-harvest taken just before the commencement of dry-down. The total transpiration is obtained by adding all daily transpiration values. Arrange ws replicated data in excel, i.e. FTSW vs NTR (as in attached dry-down workbook). Open prism-choose XY graph-enter one Y value which will create an excel sheet for analysis. Arrange FTSW values in X-axis and NTR in Y-axis. In Analysis list, choose non-linear regression-segmented linear response. Put no initial value for X0. Reverse the X-axis. In case slope 2 is not constant at one, put constrain for slope-2 as 0. Check the result sheet for FTSW xo threshold, 95% CI and R2. Also check the significance of R2 at 5% probability level.